We all probably have an idea of what the best U.S. Open moment in Pinehurst history is. 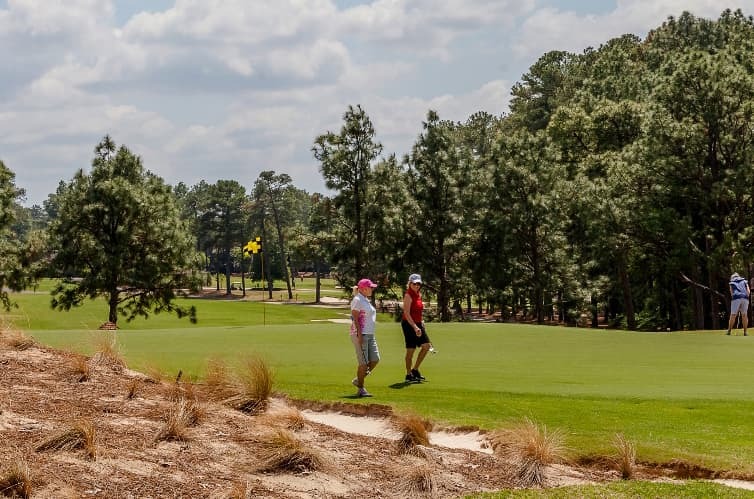 Here are five of the best Pinehurst U.S. Open moments you may know nothing about. Less than a week before the 2014 U.S. Open, several players visited Pinehurst early to get a look at No. 2, many of them taking local caddies. That included Rory McIlroy, who stayed at The Carolina Hotel and routinely rode the shuttle over to the course. There, at the clubhouse, he’d run into Frolin Hatcher every day. If you’ve been to Pinehurst, you’ve likely met Frolin. He’s one of the lovable guys at the bag drop who has been working for Pinehurst for over 50 years. One day, after finishing a practice round, Rory came up the steps at the veranda and walked into the long hallway of the clubhouse. He passed the men’s locker room, and a few steps later, out came Frolin from that locker room. McIlroy stopped, turned, and seeing Frolin, yelled back. McIlroy stood still, waited for Frolin to reach him, and put his arm around Frolin’s shoulders, walking the rest of the way to the clubhouse door. Maybe you’ve seen Payne Stewart’s Sunday scorecard from the 1999 U.S. Open in the display case in the Pinehurst Clubhouse. But have you REALLY looked at it? You can see it above. Look closely. Remember how Payne buried a birdie putt on 17 right after Lefty had missed from in close? And, of course, you remember the putt Payne made to win on 18. So look at the card again. Look at the 2 on 17 and the 4 on 18. They’re darker than the other numbers. Often, players keep score for their playing partners in major events like these. That’s probably Phil’s handwriting with the numbers. And that 2 and 4 must’ve REALLY stung. When Payne Stewart’s putt dropped at the 18th hole of No. 2, the roar from the thousands around the green was deafening. Still, it may not have quite drowned out another roar, which came around the corner, maybe less than 100 yards away. That was where the U.S. Open Media Flash Interview Area was set up in 1999, near the back entrance of the Pinehurst Country Club. As Payne and Phil came down the stretch, a large crowd of media began forming in the flash area. There, on a little card table, sat a 15-inch tube TV with the broadcast. The media swarm huddled around it, waiting to see what would happen. If Payne made the putt, he would win the U.S. Open. If he missed, there would be an 18-hole playoff on Monday. And so let it be known that the only roar louder than the one around the green at 18 was the one from the media, who had just watched that one moment in time on a little TV. Before Michelle Wie’s triumph, Lucy Li was THE story of the 2014 U.S. Women’s Open. She qualified for the Open at just 11 years old, but before she would steal the spotlight and the hearts of every media member, she made a very savvy decision: hire a local caddie from Pinehurst No. 2. That fell to Bryan Bush, a teddy bear of a guy who had the pitch-perfect sense of humor to keep Lucy relaxed and focused. The two got to know each other a couple of weeks before the Open, with Bush traveling to meet her and work with her. The partnership was a terrific one. Li, at such a tender age, played beautifully in the first two rounds. While she missed the cut, she handled the attention and the course impeccably. And there was Bush, who still works at Pinehurst, every step of the way. He was there for a quick laugh when Lucy needed it, a hug when the time called for it, and the right words of encouragement to get her around No. 2. Michael Campbell, the 2005 U.S. Open Champion at Pinehurst, has always been one of the most likable guys in golf. And while his win on No. 2 may have come as a big surprise to many, even Campbell found himself in moments of disbelief, like the time he buckled the U.S. Open trophy into the passenger seat of his rental car following the trophy presentation and media obligations. Watch above and listen to Michael tell it. It’s a great, tender, sweet story. Here’s to looking forward to new memories in 2024. Mid-week rates are valid only with a Sunday or Monday arrival.